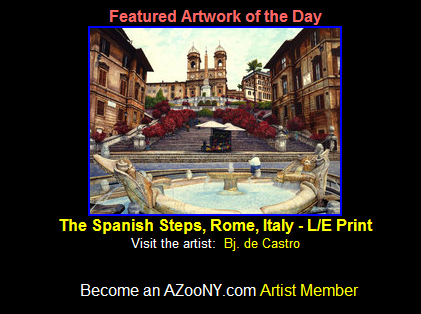 deCastro Studios Art Blog – Page 3 – California Realism Artist, Bj. deCastro – Awards & News for Collectors. We just opened a shop at CafePress! 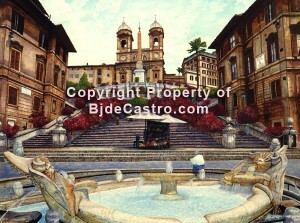 You will find all kinds of cool stuff with my art images and some logo products. Check it out and let me know what you think. Suggestions are welcome! 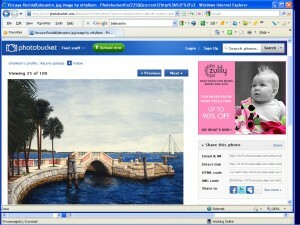 I was doing the monthly Copyright mining and found 11 of my paintings taken from my site and posted on Photobucket! 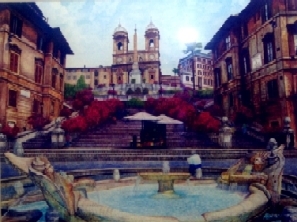 Hi Bj – The picture arrived yesterday and I love it. Thanks so much for your talent, and for making this such a smooth transaction. Hi bj. We have been so busy at the restaurant. We have had very positive feedback from patrons and friends alike. Everyone loves the food and ambience. The staff tell me that people are really taken by the mural and have even taken photos standing in front of it. “The Spanish Steps, Rome, Italy” by artist Bj. deCastro is Azoony Art of the Day once again!